“It has nothing to do with science.” That’s the message I’ve received from two different restaurant chains in the past month. To meet market demand, they’re leaning toward selling poultry meat from broilers raised without antibiotics or, at the very most, birds raised with no medically important antibiotics or some other marketing-driven restriction. It’s a difficult message for veterinarians such as myself who rely heavily on education, training and sound science to make medical decisions — not just about whether to treat but also with what and for how long. My goal has always been to use as few antibiotics as possible. We do, after all, want to use them responsibly and preserve their efficacy for when they’re really needed. On a more practical level, antibiotics also cost money, so poultry companies have no reason to use them indiscriminately. My question to poultry buyers, therefore, is this: Before arbitrarily pulling the plug on antibiotics, shouldn’t we consider the ramifications of this mandate and whether it makes sense in the first place? First, let’s look at this from a regulatory perspective. There’s a government agency charged with protecting public health by ensuring the efficacy and safety of human and veterinary drugs — the Food and Drug Administration (FDA). The hurdles to get a new product approved are high. A 2015 study found that on average it can take 8.5 years and over $30 million to develop and bring a new pharmaceutical product for livestock to market,1 according to the Animal Health Institute. It’s no wonder that the newest antibiotics for managing coccidiosis — in the ionophore class and not used in humans — are decades old and that new antibiotics in the pipeline are few and far between. When new antibiotics are introduced, they are monitored closely after they become available. The FDA is doing its job very effectively, and science has everything to do with it. I agree that to consumers concerned about antibiotic-resistant infections, it might sound like a good idea to eliminate the use of antibiotics in food animals. The problem is that many ideas that initially sound good have serious, unintended consequences. What are those consequences for chickens or for any species “raised without antibiotics”? No matter how careful we are with best management practices aimed at providing the most favorable conditions possible for animals, it’s inevitable that some flocks will get sick and need medical intervention — and without intervention, birds will suffer. As veterinarians, we are compelled by our oath to use whatever means are legally available for the “protection of animal health and welfare, the prevention and relief of animal suffering, the conservation of animal resources, the promotion of public health, and the advancement of medical knowledge.” We already have a limited, FDA-approved tool chest and being told we can’t use those tools for some reason that “has nothing to do with science” is a bitter pill for this veterinarian to swallow. Some colleagues managing flocks in antibiotic-free or antibiotic-restricted programs have said they have approval to treat any flock that gets sick. Others feel pressured not to treat because their companies have no market for chickens treated with antibiotics. These veterinarians find themselves in a very difficult position. It is generally now recognized that raising conventional flocks without antibiotics adversely affects performance.2 The chickens need more space and more feed. That means more resources are needed, including more chicken houses, more land to grow more grain and more resources such as electricity, water and fuel. The result is higher-priced chicken and a larger carbon footprint. If the anti-antibiotic trend continues to escalate, could it ultimately mean some people have to go without protein because those who can afford it are insisting on less efficient and more costly poultry production — all for reasons that potentially “have nothing to do with science”? If animal welfare is not justification enough for the judicious use of antibiotics when needed, consider the food-safety risk of withholding treatment from sick flocks with products approved as safe and efficacious by the FDA. Food-safety inspection will remove apparently diseased birds, but what are the risks of foodborne pathogens getting through the inspection system because a flock is sick? Why is this risk even necessary when treatment could have helped restore a flock to good health? It should be obvious that decisions about antibiotic treatment of poultry flocks and other food-producing animals should have everything to do with science. Granted, there is considerable scientific debate among academicians and in the public domain on this issue and some evidence presented on either side of the issue is based on good science, but some is not so good. This isn’t an easy topic to fully comprehend, and even the experts are at odds with each other in this debate. That’s why there must be a single entity that considers each product and the risk that it poses to human or animal health — an entity with the authority to approve or deny any product on the basis of that risk. I would prefer to give that authority to the FDA and have it based upon science, rather than relinquish control to a marketing department that simply wants to give customers something that sounds like a good idea. 1. Animal Health Institute. Pharmaceuticals. Time and Cost to Market. http://www.ahi.org/about-animal-medicines/pharmaceuticals/ Accessed December 7, 2016. 2. Cervantes HM. 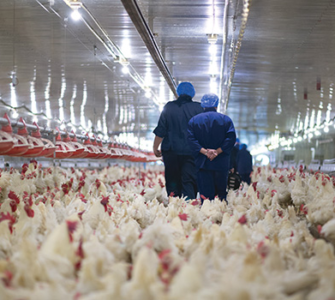 Antibiotic-free poultry production: Is it sustainable? J Appl Poult Res. March 2015;24(1):91-97.